If you have problems with recording your check details, using a checkbook calculator can be the answer to your problems. Calculators can track up to three accounts and use password security. 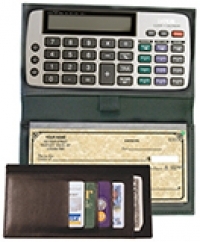 Solar power batteries with automatic shut-off help make these calculators popular with many customers. You'll find calculators in the bi-fold or trifold wallet style in a variety of colors. Calculators come in black leather or vinyl. They come in two popular formats for both top tear checks and side tear check styles. Make balancing your checkbook a lot easier when you use a calculator. Order online and take advantage of inexpensive prices.